Technical shortcomings aside, Dragonfalls story rocks; a well-spent $15 for any RPG fan. Jacking back into Shadowrun Returns for the new Dragonfall campaign, I thought I was ready for anything. In a post-magipocalypse future where trenchcoated, wizardly elves cast shield spells on hacker allies while orcs with machine guns shower them with lead, it pays to be prepared. Dragonfall managed to get the drop on me, though. I wasn't expecting one of the most memorable and complex RPG stories of the decade. 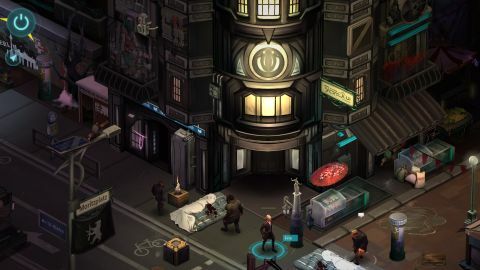 The new campaign for last year's crowdfunded, turn-based tactical RPG puts you at the head of a fresh team of Shadowrunners: elite free agents who shoot, hack, swindle, and detonate their way to payday on the fringes of society. I was, sadly, unable to import my pugilistic troll, Punchgar the Blooded, from the original Dead Man's Switch campaign. Instead, I took on the role of a pistol-wielding, fast-talking elf named Finn. My goal: to avenge a fallen comrade and unravel a plot involving a powerful dragon in the heart of Berlin, Germany's “Flux State,” where anarchy reigns, and street smarts will get you further than business etiquette. I was hesitant to dump a lot of points into social skills, since most of the dialogue options in Dead Man's Switch did nothing but save you time in dialogue trees. Investing the points paid off, however, as Dragonfall grants non-combat skills massively more time in the spotlight. Everything from knowing how to talk like a gang banger to extensive knowledge in Biotech will come up, and will make your life much easier. Finn was a crack shot with a handgun, to be sure, but it was his uncanny ability to talk his way out of his own, dumb mistakes that made him come to life as a character. Filling out the roster are some of the most interesting and unforgettable party members I've ever had the pleasure of sharing my healing items with. I could tell you hardly anything about my allies from Dead Man's Switch, but I bonded with Dragonfall's cast on the same level I have my crews in Mass Effect and Planescape: Torment. Their backstories are layered and believable, as are the ways their relationships with you can develop. The turn-based combat hasn't changed, which is a good thing. Encounters are still exciting and imaginative, with a few new additions like ley lines that boost a spellcaster's power, at the expense of usually being located outside of good cover. The possible party combinations are still extensive—I used a mix of Finn the gunslinger, a cyborg with claw hands and a ridiculous number of actions per round, and a support shaman that summoned spirit familiars while handing out buffs. You will still run into some pretty severe difficulty spikes in the mid and late game, but as mentioned previously, there are also a lot more viable options for avoiding combat (which grant the same amount of progression points as if you'd shot your way through). Outside the line of fire, I smacked up against some prominent bugs and unpolished corners of the game world. Two side quests were rendered incompletable thanks to broken triggers. A few other times, I only thought I couldn't progress because my quest log and map markers didn't update, even though the next step in the mission had been activated. And then there was that one battle wherein one of my party members completely vanished for no discernible reason. The trigger for some of these issues actually seemed to be the ability to save anywhere in a level (a welcome feature that was absent in Dead Man's Switch). They tended to crop up when I reloaded a save created right before or after triggering a major plot point. I was glad the choice was available, but quickly grew apprehensive to use it for this very reason. Thankfully, Dragonfall's story is superb enough to make up for it all and then some. The gray, moral choices I was forced to make stand side-by-side with the most gut-wrenching dilemmas in any Bioware game, and it's really the lack of finishing touches and production value that keeps Harebrained Schemes' best work from being in that same league. The plot is also far less convoluted than the conspiracies-within-conspiracies-within-conspiracies techno thriller presented in Dead Man's Switch. Dragonfall has its share of twists, but I never found myself losing track of who the actual bad guy was, or who manipulated whom, and to what end. Pacing problems still crop up here and there. Like in Dead Man's Switch, Dragonfall has a tendency to kill the urgency of some of its big “Let's do this!” moments by sending you on an unrelated side quest to get a key to get inside where your actual objective lies. Looked at individually, none of these diversions lack reward or interesting story beats. They just could have been better if slotted somewhere else in the campaign. Overall, Dragonfall took me slightly longer to complete, but felt more fast-paced thanks to avoiding Dead Man's drawn-out third act problem. Dragonfall also feels far less linear, with the bulk of the middle act allowing you to take contracts and complete them in any order you wish. I still wouldn't describe it as free-roaming, but the main hub your team resupplies at in Berlin gives you just enough room to wander that it feels like a real place. The mission locations are also more open, with more alternate paths and flanking opportunities. I'm going to remember Dragonfall for a long, long time. When the topic of great RPG stories comes up, I'll mention it in the same breath as Dragon Age or Knights of the Old Republic. Even if you didn't play, or didn't enjoy, Dead Man's Switch, Dragonfall is well worth your time—and the extra $20 for the base game, should you not already own it. It may lack the flashiness and cinematic drama of a bigger budget production, but it lacks none of the heart.